President Obama took questions about the economy on Wednesday afternoon from Twitter users. (CNN) -- Is Twitter really the best way to talk to a president? Tens of thousands of people submitted questions under the #AskObama Twitter hashtag on Wednesday, hoping the U.S. president would respond to their queries in what was billed as his first-ever Twitter Town Hall. Of course, when you're president, time is limited. So the event's moderator, Twitter co-founder Jack Dorsey, only was able to ask Obama 18 questions, followed by a few "suggestions" from the Twitter audience after that. That's 0.045% of all questions that were posed online, according to raw numbers from a group called TwitSprout, which estimates Twitter users posted 40,000 questions for the president, both before and during the Q&A at the White House. So, odds are, of course, your question didn't get asked -- much less answered. Which raises yet another question: Is it fair to turn over such a question-answer session to the people of the Internet? Or would democracy be better served by letting pundits, news people or even regular Joes who attend real-life town hall meetings ask questions of officials? The answers aren't clear, but the Wednesday event did spark plenty of online discussion on this topic. One point of concern: The way questions are selected. Twitter pre-selected eight regional "curators" -- see the list here -- who were supposed to monitor this vast sea of online question-asking to help the best ideas bubble up to the surface and actually be asked by Dorsey. In phone interviews, two of these curators said Twitter did not provide any instructions about which types of questions they should select. Drew Cline, one of the curators and the editorial page editor at the New Hampshire Union Leader, said this openness is important to the spirit of the event, which was supposed to give everyday Internet users a chance to ask questions of the president. "What value I see in this is that there actually is a chance for an average person who happens to have a Twitter account who is able to ask a good question to have that question forwarded up the food chain -- up the ranks -- and asked to the president," he said before the event. "I guess that's why they call it a town hall -- because it allows people to have their say." But some people said that didn't actually happen. Two of the 18 questions came from public figures -- one from House Speaker John Boehner; another from the New York Times columnist Nicholas Kristof. "Thanks to those who sent in good questions. Sorry POTUS (president of the United States) was allowed to be so prolix & @townhall let Kristof and Boehner crowd you out," one of the curators, Will Wilkinson, who is a political blogger at The Economist, wrote on his Twitter feed after the event. Others were disappointed that -- despite using Twitter as a medium -- the event did not feel like a conversation, and it didn't happen fully "in real-time." "They made a big deal when they were selling it to us that the whole thing was going to be real-time, but the majority of the questions were pre-lined-up," said Karl Smith, a curator who also is an assistant professor of economics at the University of North Carolina, Chapel Hill. "They made a big deal that most of it was going to be a back-and-forth. ... It didn't really go down like that -- and maybe that wasn't even possible." The president sat on a stage flanked by two TV monitors, one with the text of Twitter questions on it and another that showed a map of the United States, covered in dots that represented where questions were coming in from. But the first 10 questions all had been posted hours before the event, leading Smith to get the feeling that all of that was planned out in advance. Later, a few questions were asked that had been posted during the event. In an e-mail to CNN before the event, a Twitter spokeswoman said the White House had no role in selecting questions for the town hall and would not be made aware of the questions in advance. In addition to having curators sort through thousands of tweets, the company used an analytics firm, Mass Relevance, to figure out which questions had been re-tweeted often and which carried statistical weight with the audience. Columnists called the event a "win-win" for the White House. "The real reason to do an event like this one is that it affords the president nearly-unfettered message control with a young, national audience watching," Chris Cillizza writes on a Washington Post blog called "The Fix." Dorsey, the Twitter co-founder, is leaving open the idea of trying something like this again. 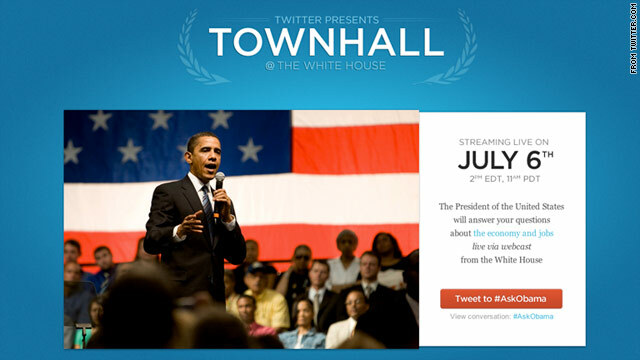 On his Twitter account, he called the event a "great first step for future Town Halls," and he asked his nearly 1.7 million followers for advice: "How can we make Twitter @TownHalls better in the future?"